Hearts came from behind to book their place in the Betfred Cup semi-finals in style with a 4-2 victory over Motherwell. Curtis Main’s early penalty handed the visitors the lead but Steven MacLean equalised before the half was out. 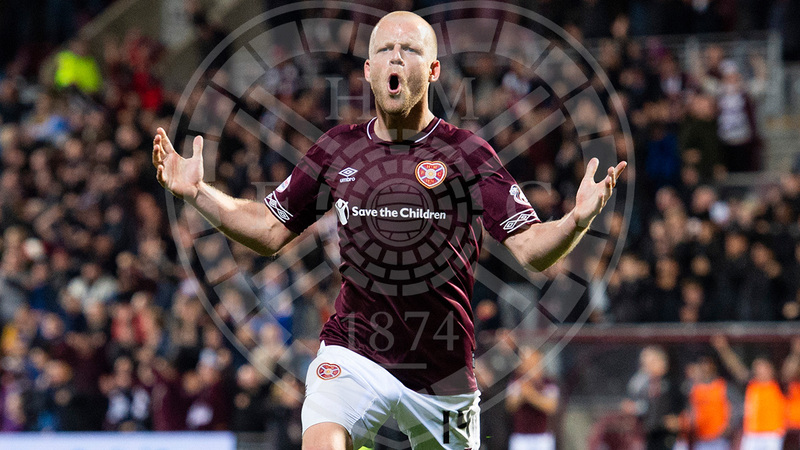 Peter Haring got Hearts in front before Ryan Bowman hit a stunning late equaliser, but the men maroon’s dominance paid off in the final minutes with Olly Lee and Steven Naismith securing the win and a place in the last four. Craig Levein made two changes from the side that drew with Livingston last week; Arnaud Djoum was handed a starting place ahead of the cup-tied Craig Wighton, while Callumn Morrison came in for Ben Garuccio. A flurry of attacks inside the opening two minutes almost saw Hearts take the lead. Olly Lee swung in a corner from the right that was met by Steven Naismith, but his header was cleared off the line by Main at the right-hand post. The resultant corner brought a carbon copy; Lee’s corner, this time from the left, was headed on target by Peter Haring but this time Chris Cadden popped up on the same post to clear off the line. Motherwell looked dangerous on the counter and on five minutes Liam Grimshaw carried the ball forward before pulling the trigger 25-yards out, only to flash his effort wide of Bobby Zlamal’s right-hand post. Disaster struck on 11 minutes when Jimmy Dunne was penalised for a handball inside the box, after he was judged to have blocked Liam Donnelly’s header with his left hand, and Main stepped up to slot home from the spot. Hearts went close to getting back on level terms just after the half hour mark. 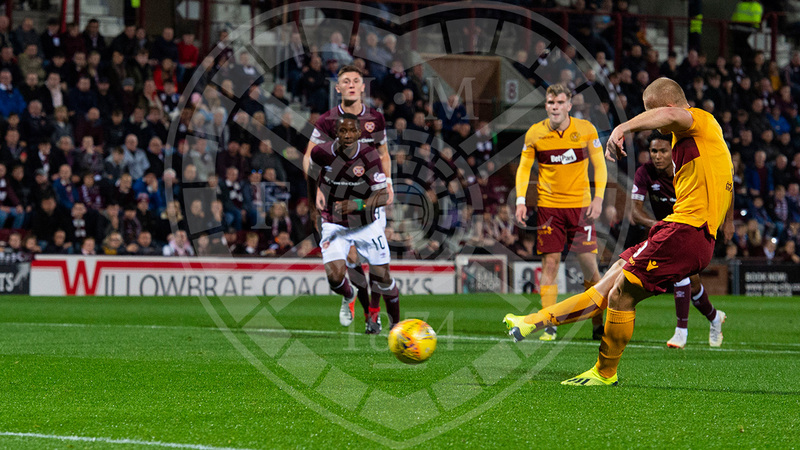 Lee burst forward through the middle of the Motherwell half to feed Morrison at the edge of the box and he moved it out for the overlapping Smith to knock across the face of goal for Steven MacLean, but his first-time shot spun over the crossbar. The visitors went straight up the park and almost doubled their advantage. Main sprung the offside trap to advance into the box but his lifted effort was palmed away by Zlamal. The equalising goal immediately followed. Gael Bigirimana was dispossessed inside his own box by Djoum who fed Morrison on the right; he crossed into the middle for Naismith to nod to the back post and MacLean was there to stab the ball into the back of the net. A lovely display of passing football nearly got Hearts in front before the half was out. An eight-pass move across the pitch in both directions culminated in Mitchell whipping in a cross for Naismith but he bulleted his header over the bar. 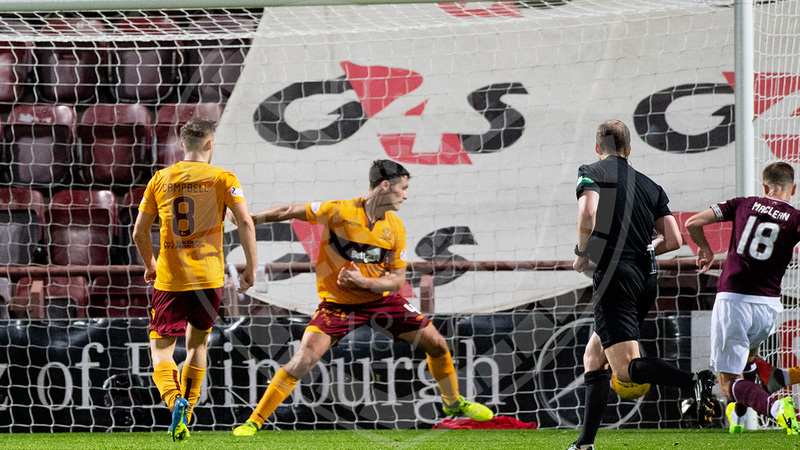 There was still time for Motherwell to create a chance of their own when Cadden swung a ball into the box for Main but he couldn’t steer his header on target. The Jambos started the second half on the attack. Morrison twisted his man inside out onteh right wing before floating a ball into the box for Naismith but his header looped well over the bar. Morrison was in the thick of it again just after the hour mark as Hearts went agonisingly close to taking the lead. He turned his man at the corner and whipped a cross into the box for Haring, who flashed a header inches wide of Trevor Carson’s left-hand post. That goal did come on 64 minutes. A clearance landed at the edge of the box and Mitchell struck it, only for the visiting defence to make a block, however the ball bounced into the path of Souttar inside of the box, and his first-time shot across the face of goal was turned in by Haring, who slid in to steer the ball home. The game should’ve been put to bed in the 77th minute. Morrison raced through on goal after MacLean’s defence-splitting pass sent him clean through, but his finish lacked power and Carson saved with his legs. Motherwell pulled level in spectacular fashion three minutes later. Bowman latched onto a long headed clearance and unleashed an unstoppable half-volley from the edge of the box, which flew into the top corner. The men in maroon squandered a fantastic breakaway moments later. Morrison skinned his man to send Naismith racing clear and he turned his man inside the box to tee up Djoum, but he could only lift his shot wide of the target. Incredibly, with one minute remaining, Hearts regained the lead. Smith bombed down the right and cut the ball back to Lee inside the box and he pulled the trigger to drive the ball beyond Carson and into the back of the net. If that wasn’t enough, there was still time for a fourth. From deep inside his own half, Lee sent a tremendous pass up the park for Naismith to chase and bear down on goal before slotting past Carson. The result leaves Hearts unbeaten in 12 matches and have a trip to Hampden to look forward to, where they will take on Celtic for a place in the final of the Betfred Cup. Hearts: Zlamal, Smith, Dunne, Souttar, Haring, Lee (Bozanic, 92'), Djoum, Mitchell, Naismith, MacLean (Amankwaa, 92'), Morrison (Dikamona, 85'). Subs: Doyle, Garuccio, McDonald, Mulraney. Motherwell: Carson, Tait, McHugh, Aldred, Cadden, Campbell (Johnson, 75'), Main, Bowman, Grimshaw, Bigirmana (Frear, 64'), Donnelly. Subs: Gillespie, Taylor-Sinclair, Mbulu, Turnbull, Maguire.